I love playing up my eyes at night, and one way to really intensify my look is to layer my lash line using eyeliner pencils and powder eye shadows. I start off first by using a very dark waterproof gel eyeliner pencil like Urban Decay 24/7 Glide-On Eye Pencil ($19, urbandecay.com) or the Makeup Forever Aqua Eyes Liner ($18, sephora.com). I trace along my upper and lower lash lines as close to the roots as possible and then end in a slight wing at the outer corners. Also line the inner rims on the waterline unless your eyes are on the smaller side then just skip this waterline step. Next, I use a flat, angled brush to apply a shimmering powder eye shadow right along the top of the liner. Use a similar hue that is slightly lighter but way more glitzy. 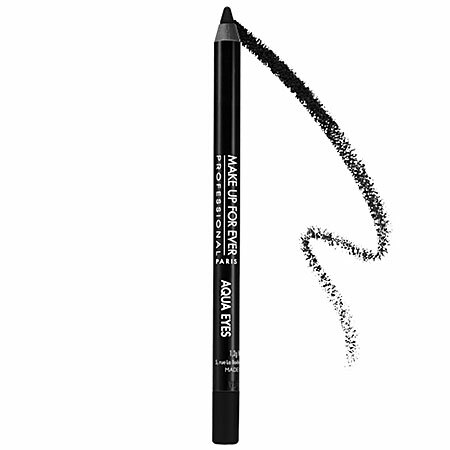 This intensifies the liner and makes the eyes sparkle without going overboard. Play with combos like chocolate brown liner with a golden bronze shadow, deep forest green liner with a glowing khaki shadow, indigo blue liner with shimmering silver shadow, pure plum liner with sparkling purple lavender shadow. On the rest of the eyes, simply Carmindize them using a highlighter under the brows on the brow bone and on the inside corners of the eyes and leave the rest of the lid bare. Use black mascara on top and bottom lashes for a flirty full fringe look. For a really festive flair, top off the lashes with a coordinating hue of glitter mascara, like one of the fun shades from Sephora’s Glitter Mascara Collection ($13 for each, sephora.com).